COLORADO SPRINGS — After establishing a foothold in the small launch vehicle market, Rocket Lab is now planning to enter the small satellite field with a bus the company says can get customers to orbit faster. At the 35th Space Symposium here, Rocket Lab unveiled Photon, a smallsat based on the kick stage the company uses on its Electron rocket. The company is offering Photon as part of an end-to-end service that includes an Electron launch and the option of handling spacecraft operations. In an interview, Rocket Lab chief executive Peter Beck pitched Photon as a platform that allows customers to integrate a variety of payloads, from Earth observation cameras to communications equipment, and get them into orbit in less time than if companies built their own satellites. Beck argued that Rocket Lab’s integrated approach will be more efficient and less risky for startups. “You can use not only a proven launch vehicle but a proven spacecraft platform, so you’re not taking any development time or risk in getting your idea into orbit,” he said. The company sees Photon as being particularly well-suited to technology demonstration missions, where customers bring a payload they want to get to space quickly before using it in a larger constellation. Rocket Lab could also provide the payloads in addition to the bus. “If you just have an idea and you don’t want to develop a payload, either through Rocket Lab or a Rocket Lab partnerships we can take care of that as well,” he said. Rocket Lab will manufacture the Photon at its Huntington Beach, California, factory where it also produces the Rutherford engine that powers Electron. The company estimates that it can produce and launch a Photon in as little as four months. 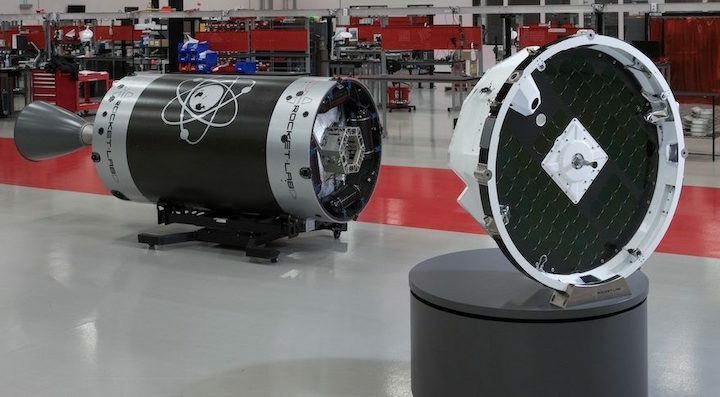 Beck didn’t give a specific figure for how many satellites the factory can produce, but said it’s “strongly linked” to the Electron production rate, which the company is working to accelerate to one rocket a week. The company has reserved about half of the space at the Huntington Beach facility for satellite production. Each Photon can carry up to 170 kilograms of payloads. Beck said the company plans to launch only one Photon at a time, but that each Photon could carry multiple payloads. The first Photon will launch no earlier than 2020 because the company’s 2019 launch manifest is full. Rocket Lab is working with “a number of customers” interested in using Photon, but Beck said the company isn’t ready yet to announce any of them. He also wasn’t concerned that Photon might dissuade companies developing their own satellites from launching them on Electrons.